The SFFaudio Podcast #011 – in which our desperate heroes attempt to display the manliness and fortitude, listing all the recent arrivals, and some recent listens. audiobooks, epic fantasy, science fiction, The Runelords, David Farland, Blackstone Audio, Brilliance Audio, Dragonheart, Todd McCaffery, Pern, Penguin Audio, Jim Butcher, Codex Alera, Furies of Calderon, Kate Reading, Random House Audio, The Widows Of Eastwick, John Updike, Peter Straub, Poe’s Children – an anthology, Stephen King, Star Wars – Millennium Falcon, James Luceno, Macmillan Audio, Robert Jordan, Brandon Sanderson, Michael Kramer, Richard Stark, Books On Tape, Frank Herbert, Heretics Of Dune, the Alan Smithee version of Dune (1984), Neal Stephenson, Anathem (28 CDs long! ), The Book Of Lies, Brad Meltzer, Ender In Exile, Orson Scott Card, Team America World Police, Sherlock Holmes Theatre, Yuri Rasovsky, audio drama, 2000X, Repent Harlequin Said The Tick-Tock Man, Harlan Ellison, Mercedes Lackey, Foundation, Wizard’s First Rule, Terry Goodkind, Legend Of The Seeker, SFSignal.com, iTunes, Infinivox, Guest Law, John C. Wright, Audio Realms, Shadow Kingdoms, Robert E. Howard, Fallout 3, and Team America: World Police‘s song we’re gonna need a montage! The SFFaudio Podcast #010 – In what may be our smurfiest show ever we’ve dropped the usual format for an exclusive interview with Bill Hollweg from BrokenSea Audio Productions. It’s a Texas sized show in which we get Bill to spill the beans on upcoming BSAP projects like the retro-Battlestar Galactica, an all new Mad Max adventure and the audio drama version of Escape From New York! Me gushing over the ongoing 7 part BSAP miniseries of Conan: Queen Of The Black Coast, then I compare BSAP’s Jake Sampson: Monster Hunter to Tales Of The Gold Monkey and Bill compares it to Temple Of The Vampire, listen for the description of Beta Flight (you’re thinking Alpha Flight‘s cheaper cousin right? ), Body Slam Alley (No one expects a wrestling audio drama! ), newcomer 19 Nocturne Boulevard, Maudelayne featuring J.R.R. Tolkien, and plenty more! The SFFaudio Podcast #009 – is a podcast that’s cool for kids and disturbing for adults! We don’t set the bar high enough. Me? I’d be like Batman, but with less hypocrisy. Scott: Argument is an intellectual process. Contradiction is just the automatic gainsaying of any statement the other person makes. Golden Age Comic Book Stories, Argosy magazine covers, Pellucidar, At The Earth’s Core, Edgar Rice Burroughs, LibriVox, A Princess Of Mars, multiple narrators, Ender’s Game, Stephen King, The Dark Tower, Frank Muller, George Guidall, Criminal Minds, Peter Coyote, Isaac Asimov, The Foundation Trilogy, more new LibriVox titles, The Castle of Otranto, Horace Walpole, The Last Man, Mary Shelley, The Wood Beyond the World, William Morris, Cori Samuel, On The Beach, Nevil Shute, The 2nd SFFaudio Challenge, Julie D., A House-Boat On The Styx, John Kendrick Bangs, Mur Lafferty, Terry Pratchett, Neil Gaiman, public libraries, NetLibrary.net, Recorded Books, DRM, overdrive.com, Bill C-61, blank media and iPod levies, what makes DRM evil, Blackstone Audio‘s solution, MP3-CD players, the proper settings for blog RSS feeds, “people will never pay for something they can get for free”, donation models, the Liaden book model, Sharon Lee and Steve Miller. 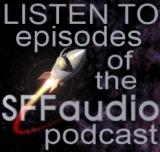 The SFFaudio Podcast #006 is here. Six is the loneliest number (after 1, 2, 3, 4, and 5) dontchanknow. In this our 6th, and sixth loneliest, show we’re asking lonely questions like: ‘If you had to choose a universe without either Ray Bradbury or Neil Gaiman, which would you pick?’ And ‘Which is the worst audiobook recording ever made?’ Pod-in to find out the answers to these and many more exciting questions that nobody asked us.